Alaska Communications Archives · Stop the Cap! When Verizon Wireless finally fired up its network in Alaska in September of 2014, the writing was on the wall for at least one of Alaska’s homegrown wireless competitors. Faced with competing against Verizon’s $115 million, state-of-the-art advanced LTE network that already supports new features like Voice over LTE (far ahead of what many customers in the lower 48 states get) Alaska Communications System Group, Inc., decided it was time to sell. ACS’ 109,000 wireless customers won’t be going far. The buyer, General Communications, Inc., (GCI) is a co-investor in the Alaska Wireless Network that ACS also relies on to offer wireless service. Besides billing and rate plans, most ACS customers won’t notice much of a change after the $300 million sale is complete during the first quarter of this year. GCI will end up with about 253,000 customers after the transaction is finished, which represents about one-third of the Alaskan wireless marketplace. The sale will mean most Alaskans will have a practical choice of three major wireless carriers — AT&T, Verizon Wireless, and GCI. ACS, weighed down by debt, wanted out of the wireless business because it has proven expensive to support a network serving a high-cost, low margin state like Alaska, where small communities are often far apart. Serving cities like Fairbanks and Juneau is one thing. Serving hundreds of settlements like Meyers Chuck (pop. 21) or towns like Unalakleet (pop. 688) is another. Like many traditional rural or independent telephone companies, ACS sees gold in its future focusing on selling lucrative broadband service to residential and business customers, where profit margins often exceed 50 percent. There is plenty of room to grow if ACS invests in network upgrades. ACS currently only has a 20 percent share of Alaska’s broadband market, primarily selling DSL service. GCI, which sells cable broadband, has managed a speed advantage. Both companies have reassured Wall Street that despite ACS’ renewed focus on broadband, there will be no fierce competition, no price wars, or lower prices for consumers. ACS will devote considerable resources into bolstering its business broadband marketing and has already secured contracts with the state government and a regional health consortium. Despite the $300 million windfall, ACS plans to turn most of that money towards paying off its debts and possibly reinstating a dividend payout program for shareholders. The company is expected to only spend $35 million to $40 million annually on capital investment projects and executives promise they will only open their wallet for projects that guarantee a high return on that investment. As a result, ACS will likely not spend much on rural broadband expansion. Alaska-based GCI has rolled out a free upgrade for customers in Anchorage, Fairbanks, Juneau, Ketchikan, Mat-Su Valley, and Sitka that delivers broadband speeds up to 250/10Mbps. GCI’s re:D broadband used to max out at 200Mbps, but thanks to channel bonding on the cable system, download speeds will be upgraded to 250Mbps in re:D service areas by the end of this year. But getting 250Mbps broadband is not cheap in Alaska. The service is priced at $174.99 a month when part of a service bundle. Broadband-only customers also pay a $11.99 monthly access fee. Both come with 24-month contracts at that price. Customers who don’t want to be tied down can choose month-to-month service for $5 more per month. At those prices, one might hope GCI would drop its usage cap, but customers can forget it. 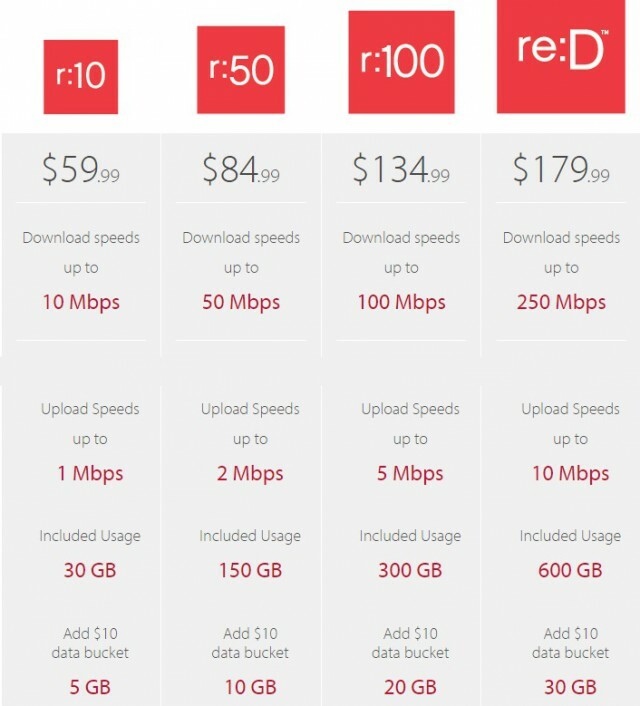 A 500GB monthly usage cap applies, with overlimit fees up to $30/GB on some plans. GCI also announced it would deliver 1Gbps next year over a fiber to the home network under construction in Anchorage, promising “no limits with what you can do with broadband” without mentioning whether it planned usage limits for its fiber service as well. GCI is asking customers to vote support for their neighborhoods getting fiber upgrades. 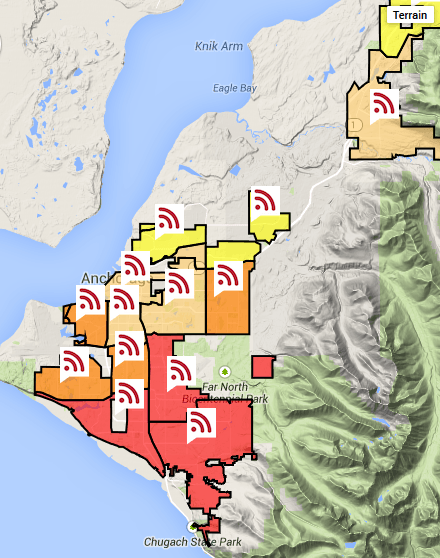 The more red sections of this map of Anchorage shows, the more customers who have shown support for fiber broadband. For most GCI customers, however, broadband will continue to arrive over the company’s HFC coaxial cable network. To better manage speeds, the company’s DOCSIS 3 platform is bonding eight cable channels, but in re:D areas the company bonds up to 24 cable channels, with plans to increase to 32 channels. The speed increases come after its competitor Alaska Communications announced speed increases of its own. ACS sells unlimited access broadband service at speeds up to 50Mbps. ACS has beefed up its copper infrastructure to support faster Internet speeds, starting with 15Mbps introduced across the state in May. Now customers in Anchorage can subscribe to faster tiers including 30 and 50Mbps. ACS has found its unlimited broadband offering attractive to customers who don’t want to worry about GCI’s overlimit fees. ACS also claims its customers get broadband over a dedicated line, not shared infrastructure like GCI, resulting in no speed slowdowns at peak usage times. 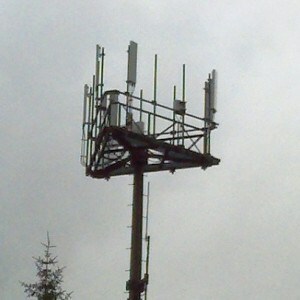 Three Wireless Competitors in Alaska is ‘Too Many’; Who Will Buyout ACS? With Verizon Wireless poised to launch 4G LTE service in Alaska for the first time, Alaska Communications (ACS) and AT&T are hurrying wireless broadband expansions to protect their market turf. But Wall Street investors are unhappy, especially with ACS’ investments in its landline network and the recently announced suspension of its dividend payout. Some are now asking whether ACS’ lucrative wireless business should be up for sale, primed for a buyout by AT&T or Verizon Wireless. Alaska Communications has soft launched its LTE 4G service in 10 cities: Anchorage, Fairbanks, Homer, Juneau, Kenai, Palmer, Seward, Soldotna, Wasilla and Whittier. AT&T operates a mix of LTE and slower HSPA+ networks in Alaska and is expanding 4G service to Prudhoe Bay and Deadhorse for the benefit of short-term oil company employees working on the North Slope. But the company is also still expanding its existing 3G network along more remote Alaskan highways. The investment frenzy is seen by many as a defensive maneuver to keep existing customers happy before Verizon Wireless arrives in Alaska sometime next year. ACS and GCI, Alaska’s homegrown phone and cable companies now jointly operate their wireless operation together. AT&T is their principle competitor. But Verizon Wireless’ impending arrival in Alaska has shown it is no shrinking violet. There are persistent rumors Verizon is trying to acquire ACS’ wireless operations. Verizon has also announced partnerships with Copper Valley Telecom and Matanuska Telephone Association to potentially expand LTE service in those communities as well. Investors hope ACS considers any Verizon offer carefully. Wireless is a revenue center for the landline phone company, which continues to see declines in home phone and business customers. Since June, ACS lost just shy of 2,000 residential landlines and 753 business lines. The company still has 57,000 residential customers and 81,000 business customers. ACS faces the same problems other phone companies do: network upgrades require significant investments, and investors question whether it will ultimately pay off. Many are also unhappy ACS suspended its dividend payout, refocusing $8 million on debt payments. Why Alaska Communications Home Internet is the best choice. Tired of nasty surprises on your cable company’s Internet bill from the cable company? 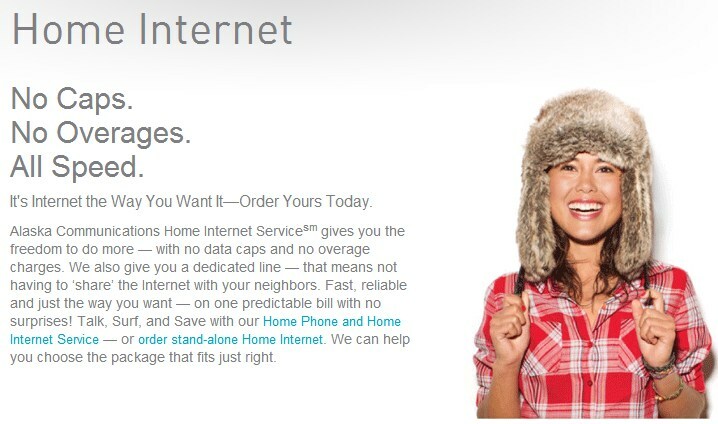 With Home Internet Service from Alaska Communications, there are no overage charges. Surf, stream, download, watch, and play – all without worry of “extra fees” for going over your bill. 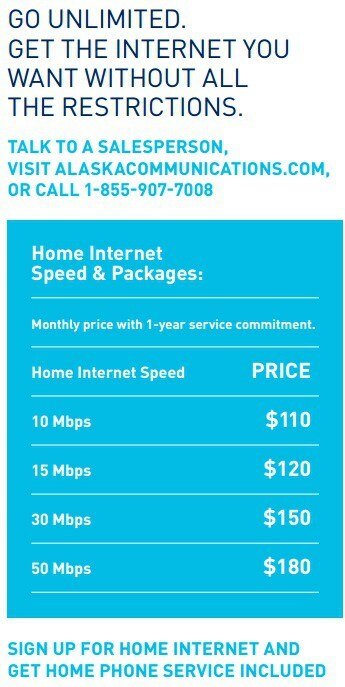 With Alaska Communications Home Internet Service, you won’t go over – it’s unlimited! Say you hopped online just a bit more this month – surfing, watching your favorite streaming movies, or maybe the kids were trying to win the online tournament of their favorite game while you were posting to your favorite social media site. We don’t think your Internet should be capped or “throttled.” That means, if you get close to your data limit, the cable company will slow down your Internet to limit your connection. With our Home Internet Service, you’ll get to use the Internet the way you want to – at the speeds you deserve! ACS recognizes the truth for most broadband customers: They loathe usage caps and throttled broadband speeds, overlimit fees and bill shock. Nobody should have to learn what a gigabyte is and be forced to watch a usage gauge before deciding whether or not to use the Internet as they wish. We congratulate ACS for delivering consumers a better choice in broadband and a worry-free Internet experience. We hope this will send a message to GCI that Internet Overcharging is unacceptable. Stop the Cap! recommends our Alaskan readers patronize the state’s largest cap-free ISP: ACS.